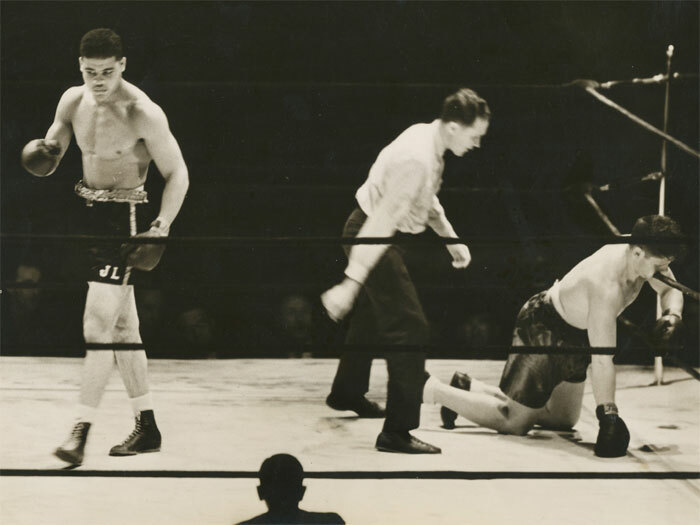 On this day in 1936, a young, pre-title Joe Louis came to fight in Philadelphia for the first time in his storied career. He was still rebuilding from his devastating KO loss to Max Schmeling which occurred just three months before. His opponent on this day was six-year vet Al Ettore of West Philly, who held a significant edge in experience over the Brown Bomber, but that advantage would not carry him to victory. Louis proved to be far too much for Ettore with his quicker and deadlier punches. The man from Detroit scored a knockdown in the very first round to set the tempo of the fight. Louis continued to punish Ettore in the second round, landing heavy blows throughout. However despite being outgunned, Ettore put up a gutsy performance. Al bit down undeterred, pressing Louis in round three to take the session. But Louis rebounded in the fourth, answering any nagging suspicions since the Schmeling loss that he couldn't fight back when pressured. Louis fought back and then some. He was back on track and dropped Ettore with less than a minute remaining in the round. Ettore managed to barely beat the count and gamely lasted until the bell rang. Finally in the fifth round, Louis nailed Ettore with a pair of devastating left hooks. The first shot was probably all Louis needed. It staggered Ettore and made him a sitting duck for the second blow. The second hook spun Ettore around and dropped him face-first into the middle strand of rope. He fell to the canvas and was counted out. The win improved Louis' record to 25-1 and put him a step closer to a title shot. After five more wins he would receive his opportunity the following June. The Louis-Ettore fight was held at Municipal Stadium in South Philadelphia and attracted 40,407 paying customers, an attendance level that still rates as the second best ever on the all-time list for outdoor fights in Philadelphia. The bout was promoted by Herman Taylor and Bobby Gunnis, the premiere promotional team in the city. On the eve of this event, Bobby Gunnis suffered a heart attack that eventually took his life. Herman Taylor would go it alone after the loss of his partner, promoting fights for more than fifty more years.